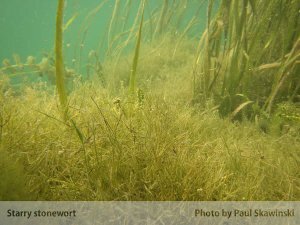 Starry Stonewort in the southeast. Zebra mussels encroaching on the northwest. Eurasian Watermilfoil a constant irritant to lakes across the state. Aquatic invasive species (“AIS”) like these are a scourge on lakes, rivers, and wetlands – overrunning natural ecosystems, often negatively impacting property values, and hampering recreational activities (and the economic benefits they bring). Wisconsin’s existing strategic plan to deal with these “invaders” dates back to 2003, and recently the Department of Natural Resources (DNR) released a draft revision to the plan that was developed in consultation with a core team of Wisconsin stakeholders that are impacted by aquatic invasive species, including the University of Wisconsin-Extension, county aquatic invasive species staff, not-for-profit groups such as Wisconsin Lakes and the River Alliance of Wisconsin, and multiple sections of DNR staff including lakes and rivers, fisheries, and law enforcement. The plan goes on to identify specific examples within each pathway and offers strategies for dealing with each. In addition to working with stakeholders on drafting the plan, DNR is soliciting public comments through Aug. 31. More information on the plan and how to comment can be found on the DNR website (scroll down to the table, and the AIS plan draft is the first item). Comments will be reviewed and addressed by DNR staff and those responses will be released with the final version of the management plan. Wisconsin Lakes is pleased to have participated in the process to develop a new state-level strategy for dealing with AIS. We encourage our members to thoughtfully review the plan and submit comments to the department. AIS is an issue that is faced by all of the lakes community, and working together we can improve on Wisconsin’s successes and overcome our deficiencies in preventing, containing, and controlling the spread of AIS. An important piece of that effort starts with your voice being heard on this revision to statewide strategy.